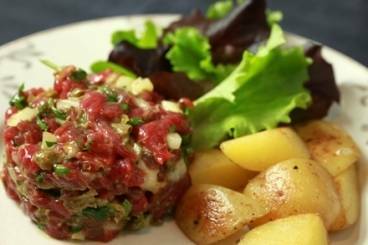 Tartare is coarsely or finely chopped raw lean beef, served in the shape of a mound with a raw egg yolk on top. It is usually served with capers, onions and chopped parsley. Fresh salmon tartare served with a rocket salad, sautéed potatoes and an orange and mascarpone dressing. A French classic of finely chopped fresh fillet steak served with golden brown potatoes, homemade mayonnaise and a dressed green salad. Fresh diced mackerel with capers, cornichons and chopped parsley served with a fresh cucumber soup. Une recette simple et fraîche de poisson cru, facilement adaptable a notre goût. Un plat génial pour les jours ensoleillés. 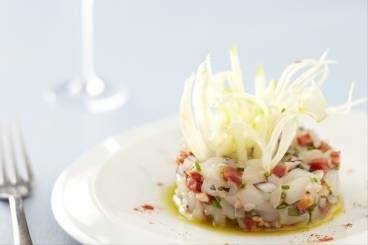 Tartare of sea bream with chorizo, red onion, chives and lemon juice served with a crisp fennel and apple salad.